I received the most sweet surprise in the mail from our friend Stasi. Stasi had a piece of her stitchery that she wanted to give a good home. She offered this to anyone who wanted to make it up into something. I entered this giveaway as it is cute and PINK! Well our friend RJ won the giveaway. I congratulated RJ and that was that. Not so! Sweet RJ told Stasi she would like her to give it to me since she knows I love pink and RJ is now gone on a 2 month long trip. THANK YOU RJ! THANK YOU STASI! Here is the piece. I have made it into a pin pillow. I am working on Happy Birthday, the next chart in chronological order for AotH. As you know, the DMC suggested is not always matching up to the pattern cover pictures. So over the long weekend I stitched up the house. I had a bad feeling about the color. I should have stopped. Yes, SHOULD have. I told myself it will be okay. I don't know why!! It just kept eating away at me. Here is how it DID look. I took a picture of it next to the pattern picture for you. My stitched house is on the left. Pattern on the right. NOT THE SAME. NOPE. So.... I stared at that completed house for two days. And then ripped out all that recommended off brown/612 and put in 3864. I used this in Pink Hill Manor with these same pinks that are being used here again. It looks good there, it looks good here. Take a look. Here is the new, improved house. A few of you recommended All the Light We Cannot See by Anthony Doer to me so I put myself on the waiting list of Over Drive, our digital library. I borrow all my audio books from my library.😊 I like free!😉 This was an excellent book. I was very surprised by what I thought was an abrupt ending. 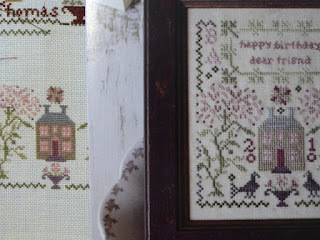 Maybe I was too immersed in the story while stitching? I actually went back to the first five minutes of the story and listened to it again for the sake of clarity. I do hope you have a wonderful weekend whatever you are doing my friends! Thank you for stopping by and leaving me such nice notes of encouragement. Love what you did with the piece from Stasi via RJ! What perfect backing fabric you use, Vickie! 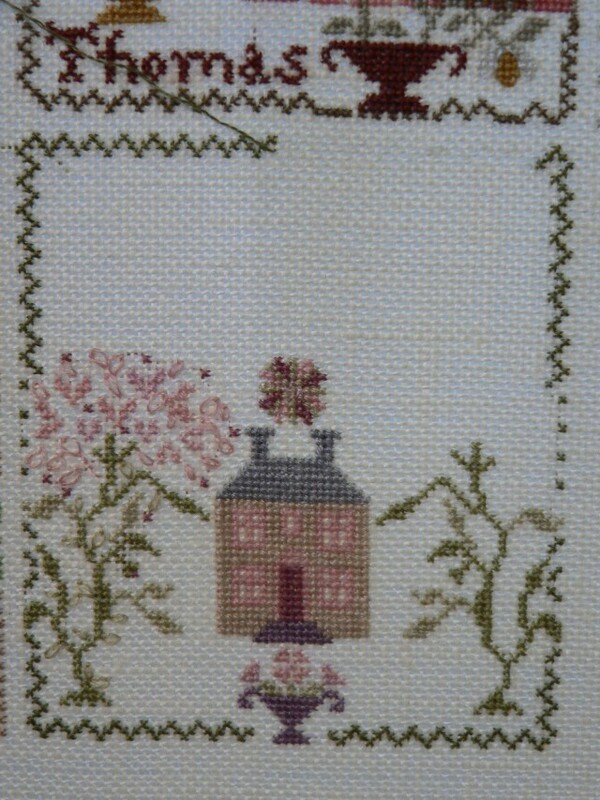 I am sorry you had to rip out the house and re-stitch it, but it definitely looks better. Glad you were able to get to your 4th of July parade. I hope you have a wonderful weekend! First of all, so glad you managed to go out on Tuesday evening and NOT get a headache! Great! Then... love the little pin pillow... what a really nice piece! And as for frogging out the house... I understand your quandry, and would probably have done the same. Glad you did it and like the substitution colors. Looking good! Hugs! I am glad for you that you could participate in the parade without a headache. A beautiful little pillow has been created, and pink fits perfectly to the whole pattern. I also like the change at the house, It looks better so. Glad you managed to enjoy the parade without getting a headache :-) Love the little pillow finish, so kind for it to be passed on to you too. I'm so glad, that you have seen the 4th July parade. You have a made a wonderful little pincushin. Miss Mabel is certainly enjoying her sunbathing! She's so sweet. The house looks lovely and I'm glad you are happier with it now. Well done on getting out for a trip without a headache, you'll have to become a night owl now. The pillow you won is lovely, perfect for you and so sweet of both RJ and Stasi to think of you. The new colour for the house looks so much better, trust your judgement! It was so nice of RJ and Stasi to gift the pink pillow. The changes you made to the house look better. I hate when the colors don't match the cover photo, especially in a large piece like you are doing. What a nice surprise, great job on your finishing. Trying to match floss with the photo of the model is never the same. They usually use the hand dyed and the dye lots are always different. Looks great! Hi Vickie: Mabel is so cute, I love how she is on her back, maybe looking at clouds and asking Murphy does that one cloud look like a dog? RJ is such a sweet lady, I hope to meet her and Mary someday. Love the pillow you are so lucky. I have also found the model never seems to look like what I stitch, I am not sure if its the camera or the color of the threads, I make changes all the time. I am happy you were able to go to the parade, we did not have fireworks we had storm warnings and loads of rain. So glad you made it to the 4th of July parade and no headache!!! I do like the house better. I have done the same sort of thing. I always say that next time I am going to listen to my inner voice. I finally got Women in the Castle from our library. So far I am really liking it. Well look at Miss Mabel soaking the sun. Oh that pinkeep is darling. What a sweet surprise. On my monitor all the houses look similar in color! I like your changes on your house. Glad to hear you could enjoy the 4th July parade.Hope you are having a good weekend. Oh that was quhite a nice thing that RJ let you have the win. It is perfect for you! I love your "Happy Birthday" so far. It looks great. As my birthday is in June, I was very proud that the BBD-Designers called their June-pattern "KHappy Birthday". Oh my Vickie, the pincushion turned out so sweetly. I am glad you were the final recipient and were able to turn the piece unto something quite adorable! RJ was very kind to pass on to you...stitchers are the best!!! P.S. The fabric on the back is perfect!!! Love how you finished your pillow that you won , so pretty . I am finally catching up on my blog reading...lol! 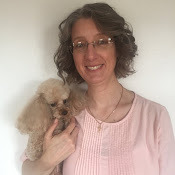 Congratulations on your beautiful, PINK giveaway win! Your finish is just adorable....love it! I hope you are having a good weekend my friend! It will be VERY hot in my corner of the world so air conditioning for me today! Sending lots of hugs and love to you my dear friend! The book sounds very interesting Vickie. 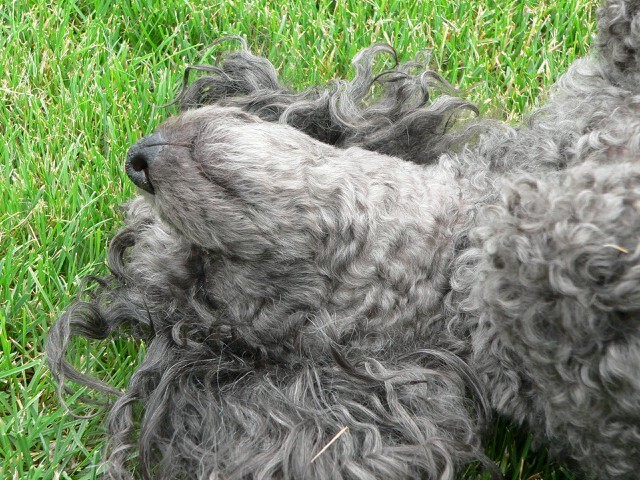 Oh, I do love that little poodle face, I'm so missing mine. I love your sweet pillow, Vicki, and love how you got it. The colors are so you, and the back fabric is so pretty...perfectly finished. Miss Mabel is too cute...give her a kiss from Teagan and Leo. 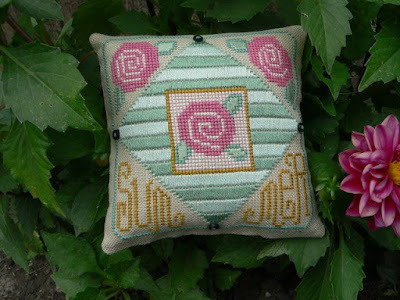 Summer cushion is very beautiful! The pillow is so cute! And your AofH is coming along - beautiful! What a delightful little pillow!! A wonderful pink gift - I think that is a Ewe and Eye and Friends design. That's a beautiful little pillow - enjoy! I read 'All the Light We Cannot See,' and I found the writing wonderful but the plot was a little unsatisfying. Have you read 'The Nightingale'? It's also a WWII book but I liked it so much more! So sweet of RJ to let you have that wonderful little piece from Staci. I think it was a good decision to rip out the house and stitch it with a different colour. I love the new colour so much better than the 612 brown. 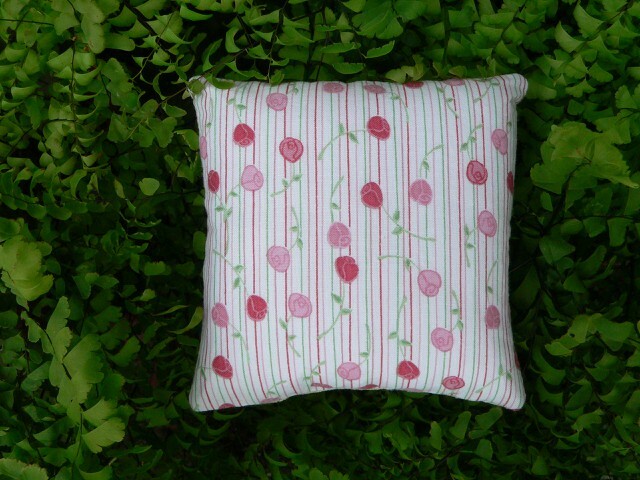 Such a lovely gift, and your new pillow is to cute and perfect for the Summer! I love your changes on your house. Lovely progress!